How do you think it felt like to live in the ancient Greek era? 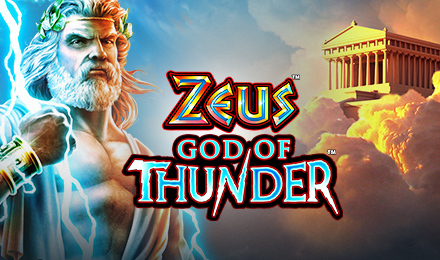 Zeus God of Thunder gives you a slightly modernised version where you can win astounding rewards. Dive into the Ancient Greek era where Gods still ruled the world. The exciting slot game has been powered by WMS and has a very creative background which displays a dark sky with clouds and occasional lightning streaks. With 5 reels and 30 paylines, the game also lets you enjoy wild symbols, free spins and a bonus wheel to win extra prizes on. Place your bet as from 0.01 to the max of 1.00 and let Zeus award you with the best of rewards ever.